Taps Fill Station – eating my way through Charm City! I am loving the new Mount Vernon Marketplace; it’s a perfect addition to the area. The industrial space makes it feel trendy and new, inspiring me to chat with all the owners. On this particular Saturday, we stopped at Taps Fill Station. Mostly cause we were able to snag some space at the bar, their menus are stuck inside current magazines, and you can bring whatever food you want over to the space. 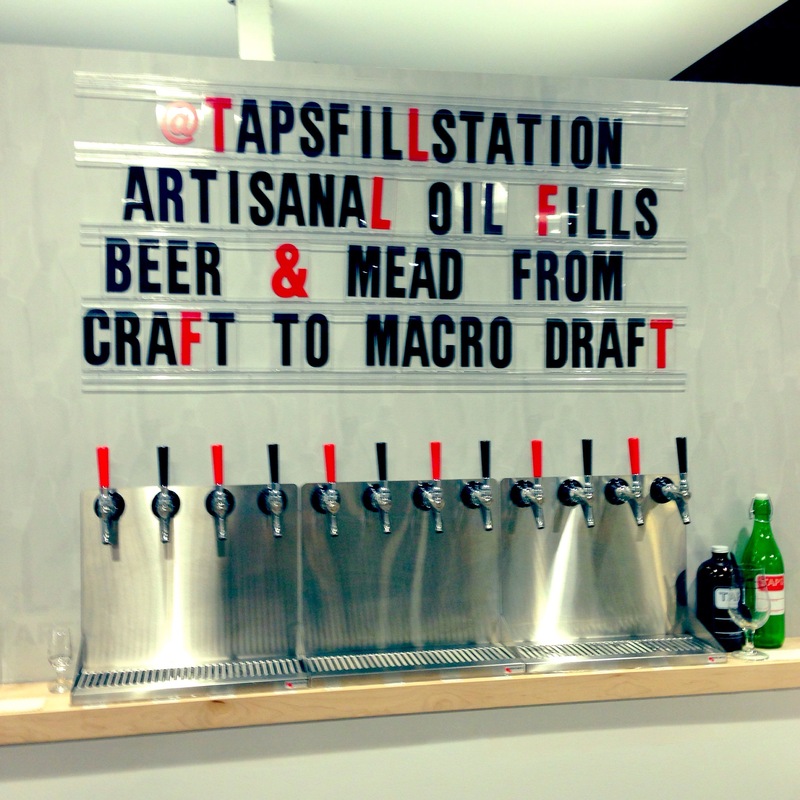 There is a marble wall of red and black taps – tons of choices of craft beers, cider, mead, and wine. The choices change with the seasons and the owners heart. I like that you can get a flight and try a few things. We shared a wine flight and a beer flight. The wine flight is basically a 2oz pour of the wines available, plus one of the ciders or meads for a total of 4 pours. They have a ton more beer choices. It will take more than few flights to try them all. These guys also have coffee on nitro and olive oil. Super fun. This entry was posted in Charm City, Drinks, Hooray!!! Winner!, Mount Vernon. Bookmark the permalink. Hey! I’m coming to Baltimore for 5 days in July for work, but will be escaping as often as possible in search of great food and drink. Would love to hear some of your top tips around the city – I’ll keep an eye on the site too. I think we’re staying just south of Evergreen, so will need to travel around a lot. Woodberry & Union Craft look like good places to start up North? Hi Matt! How exciting! If you click on the “Where Have I Been?”, the Hooray link will have my most recent “5stars”. If you click for older posts, you can see a few more posts. I also have it separated by neighborhood. Not sure exactly what you are looking for, but my favorites (in various levels of fancy and price) are Sotto Soppra, Of Love and Regret, Ouzo, Papi’s Tacos, and Katana. B&O, Wit and Wisdom, and Bookmakers have great cocktail programs. Oh, and Clavel… How could I forget Clavel. have you been to cultured? it’s wonderful! I haven’t actually been to Cultured yet, but Andrew was one of my favorite things at the Corner, so I can only imagine.